I'm not much of a scent person because I work in a very scent free environment and I find it difficult to dish out that much money for something I don't wear every day. I also find it very difficult to find scents I like because I find strong scents often give me a headache. About 2 years ago, I won a Biggest Loser competition for losing the most weight and one of the prizes was any perfume of my choice from Shoppers Drug Mart. It was a box of 10 samples of perfume that they carry and a gift certificate. 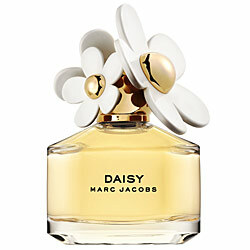 I spent a week spraying and wearing each perfume and finally decided on Marc Jacobs Daisy. I tend to go for the softer, sweet and fruity perfumes and this had it all for me! "Strawberry, Violet Leaves, Ruby Red Grapefruit, Violet Petals, Jasmine Petals, Musk, Vanilla and White Woods." While there is musk in there, its not overpowering like most perfumes. I get mostly the sweet scents when I spray this. It settles down after a few hours of wear but still sticks around and doesn't disappear. And look at that adorable bottle! It has to be one of the cutest perfumes on the market. It looks great on my makeup table as a decoration too. 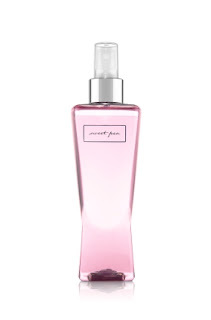 "Sweet Pea, Watery Pear, Logan Berry, Rhubarb, Cyclamen, Freesia, Raspberry, Musk." That's all for now. If you like sweet, soft subtle scents I highly suggest you try these out. If you would like me to write a blog post about any of my other favorite beauty items, please list them in the comments below :). I love sweet scents, I'll go try these out for sure! Congrats on winning the weight loss competition. I find that losing weight is the hardest thing to do but such a big accomplishment! You should be really proud of yourself! I love the Marc Jacobs scent but right now I've been using D&G #3 and it's so awesome. I don't think I can wear anything else lol! 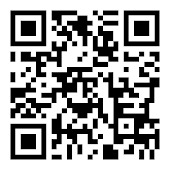 i hope we will follow each other! I've gotta say, my favourite pefume that I've got right now was super duper cheap, from Garage Clothing, of all places! It's actually like spraying on a ray of sunshine, covered in fuit and flowers!